the other hand, what if it's not. Read my article to see the pros and cons of art being taught in school. In 2002, a study showed that when students were exposed to the arts, like drama, music, and dance, they are much more proficient at reading and academics. In the article 10 Studies that Support Arts and Education published by The Center for Online Education it states “It is estimated by the end of this year, 25% of public schools would have completely dismantled their own arts programs” This is because of budget difficulties that they are facing Schools may think that the arts are simply an activity, and that they are not necessary to a school environment. 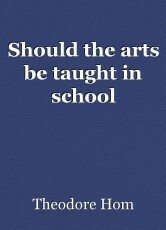 We strongly agree with the arts being taught in schools. Firstly, there are numerous benefits of having the arts be taught in schools. Art helps children express their feelings through many forms of works and action. Studies even show that using an instrument, or holding a paintbrush, can even improve your basic motor skills, says Lauren Martin. The children that study arts develop good community cohesion skills, and learn how to work in a team. This is critical when searching for a job, as teamwork is key. The arts can connect students to the bigger world, while still giving them a creative outlet to express themselves and their art. Also, art can change the future life of a child. "I wasn't always the best at math and science, and for a long time, I thought that meant I wasn't smart, because that's what schools teach. Smart people are good at math and science. It wasn't until I discovered art at school that I found something I could excel at," says Abby Huston, 2017 young artist winner. The arts can be a good career choice for someone who isn't the best at math or science and has a lot of ideas. It is good if you choose a career that you enjoy, and the arts can be a very enjoyable career. The way Abby Huston found the arts was through school! Imagine if her school had decided to remove the arts long before she arrived. She would have gone her entire school life, and maybe even her entire life, thinking she wasn't smart enough because she wasn't good at math or science. When in reality she just didn't have the opportunities she needed to succeed. Lastly, arts education helps children succeed in the ways that schools want them to. A study by the Solomon R. Guggenheim Museum of Art shows positive results when children are exposed to the arts. These results include improved literacy skills and even higher graduation rates. Opponents aren't informed that having an arts program helps with their academics. There are advantages such as improved math, reading, and writing. Even neuroscience has proven that the arts in our schools help rewire the brain in a positive way. (according to Ten Studies that Support Arts in our Schools by Center for Online Education) The arts have even been proven to increase a students IQ scores! This helps them in the long-run, because the arts in schools have even shown higher graduation rates. Overall, all of these ideas help support the arts being taught in our schools. However, some will say "The arts are going to distract the children from the more important subjects like math and science!" but, the arts are just as important as math and science and can help improve their overall academic prowess. If we just cut the arts out of all our schools, it might not expose children to new things! They would have to learn about the arts later on in their life, where it would be much harder to learn. Children who would excel at the arts like dance or visual, would go their whole lives thinking they aren't good enough, simply because they had talent but could not express it. © Copyright 2019 Theodore Hom. All rights reserved. I liked this essay a lot. I completely agree with it. Moreover, I would like to add that art forms a basic ingredient of culture.Nobody is going to visit another country to have a look at all those wonderful bookkeepers in those quaint offices. Perhaps those who try to run things purely from an economic/monetary point of view, should remember that, before they try to banish art from education. I dont if art program = art class...I do think there should be art classes. If a student wants to get more serious about it then private or even city art classes should be persued.